Most football fans acknowledge that one of the keys to being successful on the European scene is to keep clean sheets, particularly in home matches because away goals are worth their weight in gold because of the tie-breaking rules. If one subscribes to the view that UEFA Champions League winners, by and large, have excellent defences and do not leak like colanders, then surely there is value available in betting on the outcome of this season’s thrill-a-minute competition that has reached its quarter-final stage. Bookmakers have elevated Barcelona back to UEFA Champions League favouritism at odds of around 13-8 following its Harry Houdini act against Milan. And the betting favours Barca’s domestic rival, Real Madrid, meeting it in the final, which is scheduled for Saturday 25 May 2013 at London’s Wembley Stadium. The Meringues are available at odds of around 13-5 and it is 5-1 bar the top two teams. In spite of its domestic dominance, Barcelona has kept a clean sheet in only 13 of its 46 competitive matches this season, with its home numbers being seven shut outs in 23 games. Real Madrid’s home statistics are better – 13 clean sheets in 23 matches – but overall it is running at almost the same rate as Barca with both sides below 30 per cent. Even at the best UEFA Champions League odds available, it is around the 1-2 mark that either Barcelona or Real Madrid takes out this term’s edition of European club football’s top event. Laying that proposition on a betting exchange or backing one or more of the other six sides seems sensible. Laying Barcelona and Real Madrid means that one is getting odds of around 2-1 about Bayern Munchen, Dortmund, Juventus, Paris Saint-Germain, Malaga or Galatasaray lifting aloft the UEFA Champions League trophy. Having done the homework on clean sheets, there is little to recommend backing Dortmund or Malaga over the two favourites and nothing to support getting with Galatasaray. That leaves Bayern, Juventus and David Beckham’s Paris Saint-Germain to investigate further. Bayern has kept 22 clean sheets in its 39 competitive games this season, including eight in its 20 home matches. Those are excellent numbers but one should note that Bayern has managed only one UEFA Champions League shut out in eight attempts and that was versus French middleweight Lille. Juventus has kept 20 clean sheets in its 42 competitive games this term, including 14 in its 22 home matches. Those are outstanding numbers even accounting for the widely held view that the Italian Serie A is not as strong as it was 10 or 20 years ago. Juve has registered five UEFA Champions League shut outs, three at home and two on the road. Paris Saint-Germain has kept 23 clean sheets in its 42 competitive games this season, including 13 in its 22 home matches. French Ligue Un is not the strongest domestic tournament in Europe but Beckham and company have done pretty well in the UEFA Champions League, managing three shut outs, so they are genuine live outsiders. So what is the best way to oppose Barcelona and Real Madrid if one believes that their defensive shortcomings mean that they are under the odds to win this term’s UEFA Champions League. 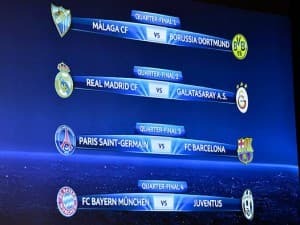 Well, for starters, the situation is complicated by the fact that only one of Bayern and Juventus can make the semi-finals after being paired in the quarter-finals. Given the statistics listed above, there are worse bets in the world than backing Juventus at odds of around 16-1 and Paris Saint-Germain at odds of around 40-1, with dutching them producing an 11-1 wager. Paris Saint-Germain is the most interesting of the two, primarily because it plays its UEFA Champions League quarter-final first leg against brilliant but brittle Barcelona in the French capital. Paris Saint-Germain coach Carlo Ancelotti is a Milan legend so one can guarantee that the Italian will have seen how the Rossoneri went oh so close to knocking out Barcelona and how important it is to limit their away goal-scoring chances. A Paris Saint-Germain clean sheet at home – even a 0-0 draw – would put Barca under a lot of pressure at Camp Nou. The offers of around 9-2 about Paris Saint-Germain eliminating its high-profile Spanish opponent are remarkably generous. The full draw for this season’s UEFA Champions League last eight sees Paris Saint-Germain play Barcelona, Bayern play Juventus, Real Madrid play Galatasaray and Malaga play Dortmund. The quarter-final ties start on Tuesday 2 April 2013 and it is first UEFA Champions League season in 17 years that no English Premier League team has made it to the last eight. So much for the all-powerful English top flight.